Please continue scrolling to make a financial contribution in support of this event. International Overdose Awareness Day is a global event held on August 31 each year and aims to raise awareness of overdose and reduce the stigma of a drug-related death. It also acknowledges the grief felt by families and friends remembering those who have died or had a permanent injury as a result of drug overdose. Thousands of people die each year from drug overdose. They come from all walks of life. Do you recognize the signs and symptoms of overdose? What is the impact of drug use and overdose on family, friends and those experiencing it? 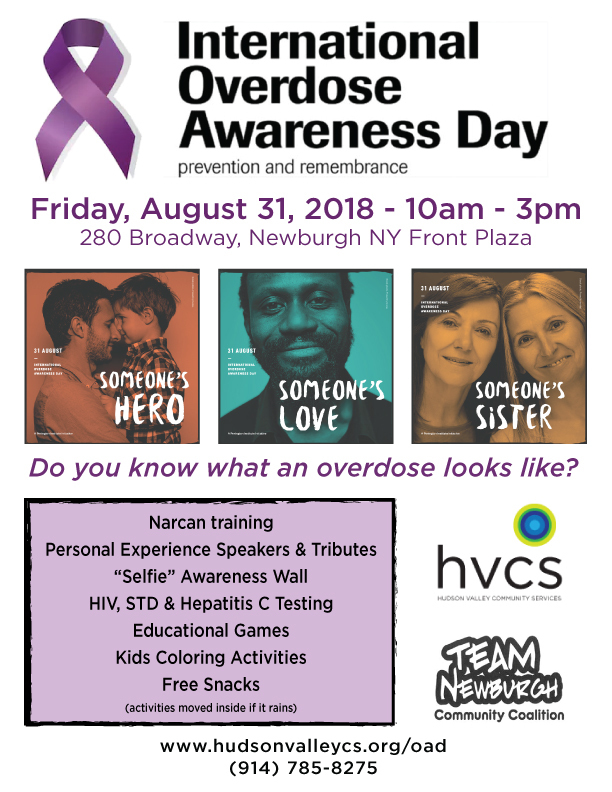 Join HVCS and Team Newburgh on Friday, August 31, 2018 for a day-long awareness event and memorial to those lost to overdose in the Hudson Valley.